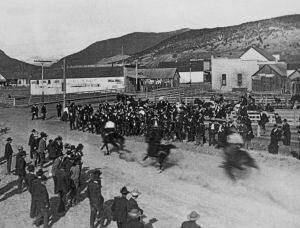 This horse race was on Grand, the Town Hall is shown on the right. The first building on this site was a saloon which was built in 1890. It was the second saloon in Eagle. Little is known of this building. We believe that the first saloons were built in this area because of their proximity to the railroad depot. That building was replaced by the current building. The new building was built by Ed Hughes of Glenwood Springs in 1903. The original brick building was one story high and 50 feet square. It was the first brick building in Eagle Located just one and half blocks from the train depot, the Hughes building was part of a thriving business block. 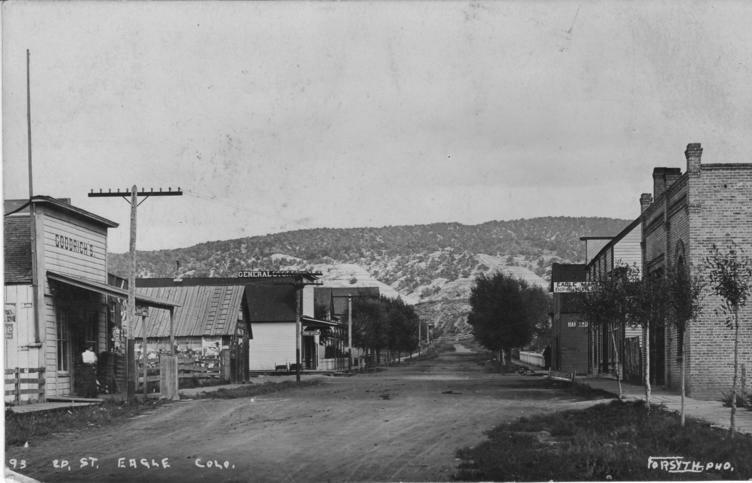 The first business in the building was the “Eagle Club” saloon, operated by C.S. Lumley. The saloon was a lively place, featuring a musical slot machine. In 1907, the saloon sold to brothers Byron and Charles Zartman. During 1918, the Red Cross remodeled the building into a hospital for treating patients during the Spanish Influenza epidemic. When the epidemic ended in 1919, the building was remodeled again into an auto show room. A merchandise store also used the space for some time. By this time the building had steam heat and electrical wiring. During the 1920s, an addition was built on the east side for use as a firehouse. This new portion included the second story. The upper floor was used for custodian’s quarters. In 1930 the “Delphian Society,” a women’s home study group, recognized a need for a place for ranch and farm wives to gather when they visited town. The Society purchased the structure for use as a public gathering place. It was known as the “Community House” for many years. Tax issues prompted the Delphian Society to eventually sign the property over to the town. In 1958 the building became the Eagle town offices and a new exterior finish was applied to the building. In 1962 a small public library was located upstairs. In 1977 the building was declared a National Historic site enabling the town to qualify for a $12,500 grant for remodeling. After the remodeling was completed the building was officially named the Eagle Town Hall. Town business was conducted from the building until 2002, when the new Town Hall was built at Second and Broadway. Once The Town of Eagle moved the building is was used for a number of businesses including a skate shop. In 2008 the Eagle Valley Enterprise moved to this location from another Eagle location.